Already a member? Right this way. Get in on our biggest sales and shop new arrivals ahead of everyone else—and receive invites to exclusive Shopbop | East Dane events. Rest assured: We’ll never forget your birthday or miss a big moment (like when you level up)—and we'll make sure you're celebrating in style. From Mystery Money surprises to VIP-only sale events to our members-only customer service line, extra luxuries are what being a VIP is about. Where you stand—and what to look forward to! All Prime customers get early access to new-to-sale styles—no matter which tier you're in! What is Yours Truly Shopbop Rewards? It's our loyalty program! We've designed it to give back to our best customers—a.k.a. YOU—because we are happy you're here. What is All Yours East Dane Rewards? It's our men's loyalty program—exactly the same as Yours Truly Shopbop Rewards, but connected to East Dane, our men's site. Because these programs are connected, you can't be a member of both, but your purchases from both sites will contribute to your annual spend—and you can redeem benefits on either site! If you decide you'd rather be a member of All Yours East Dane Rewards, just deactivate your Yours Truly Shopbop Rewards membership and head on over to East Dane to sign up! If you already have a Shopbop | East Dane account, all you need to do is visit the Yours Truly Shopbop Rewards page and sign up! If you don't yet have a Shopbop | East Dane account, you can create one here and then sign up to become a member of Yours Truly Shopbop Rewards. How is my Yours Truly level determined? Your level is determined based on your spend from December 1 of the previous year to 30 days before today. So, if you join on May 15, 2019, your level is calculated by adding up your purchases from December 1, 2018-April 15, 2019. Items you buy on Shopbop | East Dane, including purchases made using gift certificates, contribute to your spend. The following do not apply to your spend amount: Returned purchases, purchases of gift certificates, duties, taxes, gift-wrapping, and shipping fees. How can I find out my level? 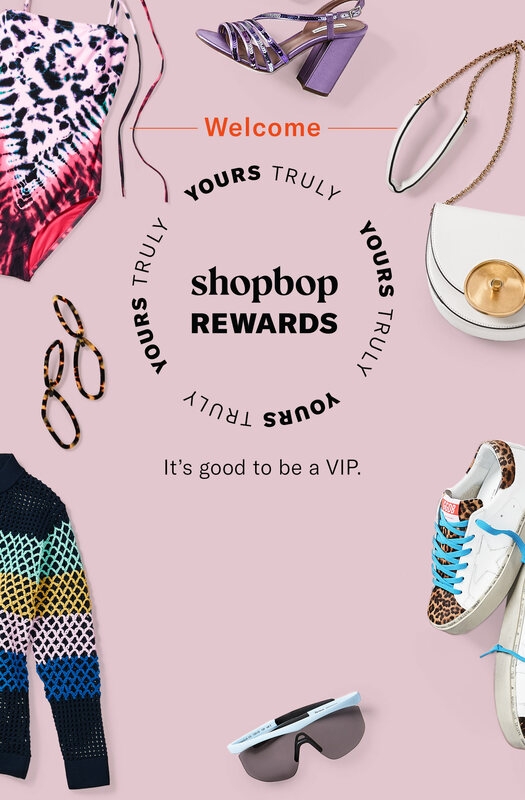 Once you've signed up for Yours Truly Shopbop Rewards, you gain access to a personalized dashboard with all the details about your program level, the perks that come with it, your progress toward the next level, and the benefits you'll enjoy once you get there! Do levels expire or get reset? Once determined, your level status is valid through the end of the following year. Then, every January, your spend will reset to $0, and you'll need to requalify for your current level in order to remain there after the next level reset. For example: If you ended 2017 at the Gold level, you’re locked into Gold status for 2018. To stay Gold for 2019, you'll need to continue spending at a Gold level during 2018. If instead you spend at the Silver level during 2018, your level will reset to Silver at the beginning of 2019. How do I receive my perks? We will alert you of your perks or send them to you by email. Some of the perks are available at checkout, and others are use-whenever coupons, but whatever the benefit, we'll email you everything you need to make sure you get your perks. What if I have more than one Shopbop | East Dane account? At this time, we cannot combine accounts, so to maximize your perks, we urge you to shop under one account only. By shopping under one account, you can receive credit toward your program level status for every purchase you make (and reap some serious rewards). How do I get the Amazon Prime-specific loyalty benefits? To get these perks, you need to be a member of both Yours Truly Shopbop Rewards and Amazon Prime. Make sure you link these two accounts so you can automatically start receiving Amazon Prime-specific loyalty benefits. If you’re not sure how to link your Shopbop and Amazon Prime accounts, please contact customer service contact customer service and they’ll help you update your information (and get your perks). Where can I see the Yours Truly Shopbop Rewards policies? Yours Truly Shopbop Rewards (hereafter known as the Program) is governed by these policies and FAQs and by the BOP Conditions of Use. To participate in Yours Truly Shopbop Rewards, you must have a Shopbop | East Dane account, and only one account may be associated with your Program participation. Promotional codes you receive as part of the Program are subject to the terms and conditions included with those codes and may not be used to apply discounts towards previous purchases, purchases of gift certificates, taxes, duties, or shipping (unless otherwise specified). All promotional codes are personal to you, have no cash value, and may not be sold, transferred or shared with others. Unused promotional codes cannot be reissued after expiration date. We reserve the right to change, modify or discontinue the Program or these policies and FAQs at any time. Participation in Yours Truly Shopbop Rewards by commercial customers or purchasing for resale is not allowed. We may suspend or terminate your participation in the Program at our sole discretion at any time. In the event that your participation in the Program is terminated, you will not be able to use any promotional codes, even if the expiration dates associated with such promotional codes have not yet passed. Shopbop | East Dane Employees are not eligible for the following perks: Early Access to Sale, Level-Up Gift, Birthday Discount, Mystery Money, Exclusive Events, Early Access to New Markdowns (Prime). How do I exit Yours Truly Shopbop Rewards? The option to deactivate your Yours Truly Shopbop Rewards membership appears at the bottom of your Dashboard page. What is early sale access? As a Yours Truly Shopbop Rewards member, you get to shop our biggest sales ahead of everyone else. How's that for VIP access? At Shopbop | East Dane, we love a fun party. And once you hit the Platinum level, you'll be invited to one of our exclusive events each year! Wait, so what do I get on my birthday? At each level, with the exception of Bronze, you'll receive a birthday discount of 10% (Silver), 15% (Gold), or 20% (Platinum). Happy birthday to YOU! NOTE: Make sure you sign up for loyalty at least a month before your birthday in order to get your special discount. If you sign up less than a month before your birthday, you will have to wait until next year to enjoy this perk—but we promise, it’s worth it. Want more details? Right this way. You'll graduate to the next level once you've reached the spend ceiling for your current one—and you'll also receive a just-for-you token of our appreciation! Whenever one of your sold-out favorites (a.k.a. anything from your Hearts or your Wish List) comes back in, we'll let you know ASAP with an app notification or email. Mystery Money is a surprise discount you'll receive at some point during the year—but when? And for how much? That's for us to know and you to find out! How does the VIP Customer Service line work? Upon leveling up to Gold, members receive an email with contact info for our special Customer Service line reserved for Gold and Platinum members only. Call anytime, day or night! What is early access to new arrivals? All Yours Truly Shopbop Rewards members with Amazon Prime will be granted early access to new-to-sale styles once a month! What are Private Sale Events?